In this article our Exhibition Assistant, Ian Mackintosh, writes about the new additions that have been added to the exhibition since it began its tour around Scotland. Since Hosts and Champions was first exhibited at the Old Fruitmarket, Glasgow during the 2014 Commonwealth Games we have had some major new additions to our Commonwealth Games Archive. This material has been donated by the families of Sir Peter Heatly and Mr William Carmichael. Both of these gentleman were involved with the Scotland team in a variety of roles including competitor, judge, Team Manager and administrator. 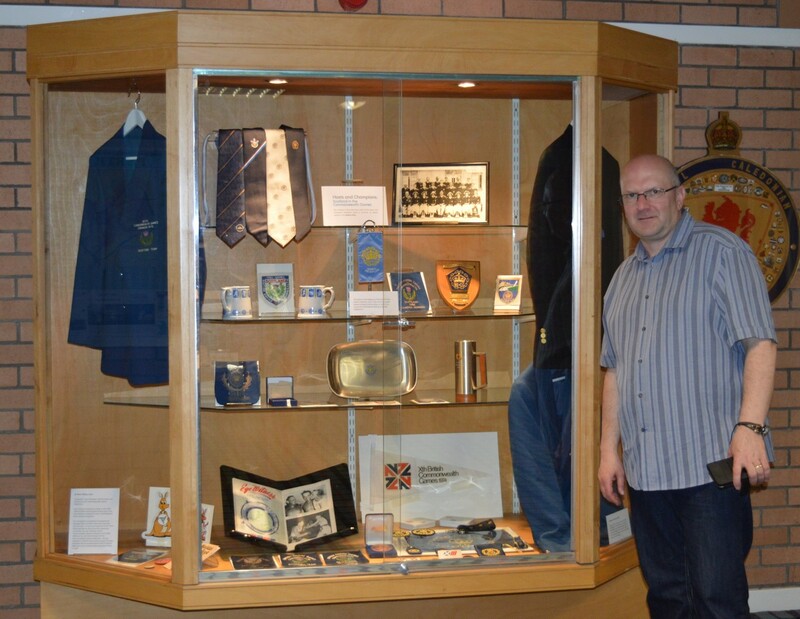 Now that the exhibition has moved onto the Dewars Centre in Perth we have extra display cases available where we have the opportunity to display some of these new items. Sir Peter Heatly’s long and distinguished association with the Commonwealth Games is reflected in the material which has been donated by his family. The items, which include clothing such as Team blazers, ties and badges, cover his time as a competitor in the 1950s (when he won gold medals for diving in 1950, 1954 and 1958) and his later career as Team Manager and administrator. 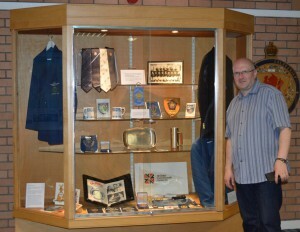 Our Exhibition Assistant, Ian Mackintosh, with the display of material from Sir Peter Heatly’s collection he created for the exhibition in the Dewars Centre, Perth. On retiring from competing Sir Peter became manager of Team Scotland and received gifts such as stone ware mugs in Perth, Australia, in 1962 and a plaque from the organisers of the 1966 Games in Kingston, Jamaica. As a member of the organising committee of the 1970 Edinburgh Games Sir Peter received many gifts from visiting nations and was also presented with a silver plated tankard and salver for his committee work. These are just some of the items that we have chosen to display as part of the exhibition. While the exhibition was in Irvine from March to April 2015, we were contacted by the family of Mr William Carmichael. They had a collection of items that Mr Carmichael had collected as an Administrator for the Scottish Commonwealth Games Team and the Great Britain Olympic team. 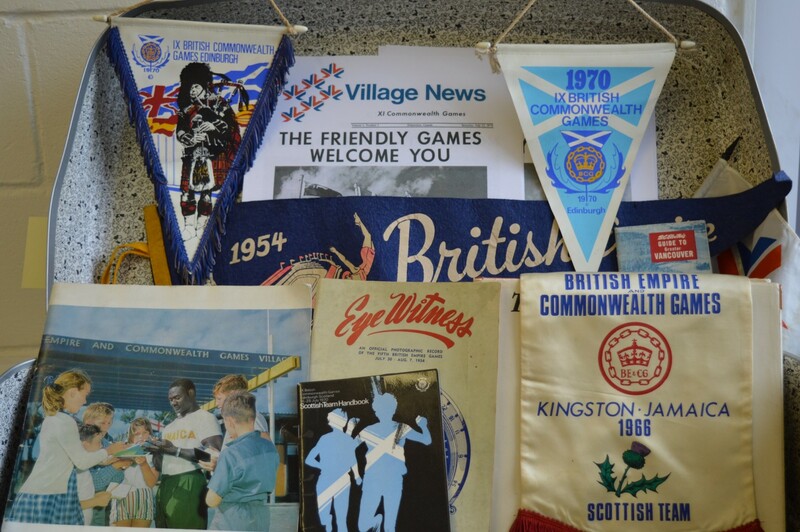 We have gratefully accepted this material and it has proved to be a treasure trove of Commonwealth Games history. Included in the collection is a roll of Clan Edin Tartan from the 1970 Edinburgh Games. This was the first time that a tartan had been commissioned especially for the Commonwealth games. 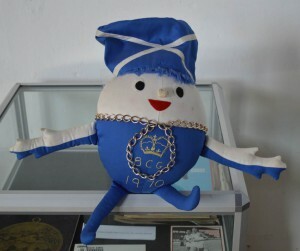 A hand-made mascot for the Scottish team is also included, not, however ‘Wee Mannie’ who we have written about before. The Edinburgh 1970 mascot which joined our touring exhibition in Irvine! Other items include pennants that were designed for the 1950, 1954 and 1970 Games. The Carmichael Collection also has a large selection of badges which he collected over the years. Mr Carmichael was also an international wrestling judge and he attended the London 1934 Empire Games in that capacity. His judge’s badge for this competition is part of the display in Perth. It is one of the earliest exhibits that we have in our collection. These are just some of the many new items we are able to display in Perth and we are grateful to the Dewars Centre for the opportunity to exhibit this additional material. A selection of the Commonwealth Games memorabilia collected by Willie Carmichael which has been donated to the archive. The exhibition will be on display in Perth until Saturday 27th June. Why not pop into the Dewars Centre and take a look at this fascinating slice of sporting history?